I went to church on Sunday. Not because I wanted to, but to help someone out. It was an interesting experience. There were some really nice people there – good people even. They would say they were good… no, they wouldn’t, they would dispute they were good… they would say any good qualities they had were the result of Christ and the indwelling of the Holy Spirit. But such a claim doesn’t account for all the other good people we encounter in life who don’t believe in Christ or the Holy Spirit or any of the other aspects of the Christian faith. It doesn’t account either for the mean-spirited, spiteful and obstructive folk that we find in churches. If Christians have been regenerated through faith in Christ – the Bible calls them ‘new creations’ in 2 Corinthians 5.17 – then there shouldn’t be any unpleasant, unloving folk in church, should there? The minister on Sunday made much of Christians being ‘works in progress’, but this sounds like a nice way of making excuses for difficult people. Some folk manage to be good and loving without faith, without ever being a ‘work in progress’. A Christian commenter on another blog I read, ‘Why There Is No God‘, argued the other day that we shouldn’t judge a religion by the way its adherents behave. But what other way is there to judge it? If a religion doesn’t make individuals more loving – and this is what Jesus claims distinguishes his followers (John 13:35) – then of what use is it? 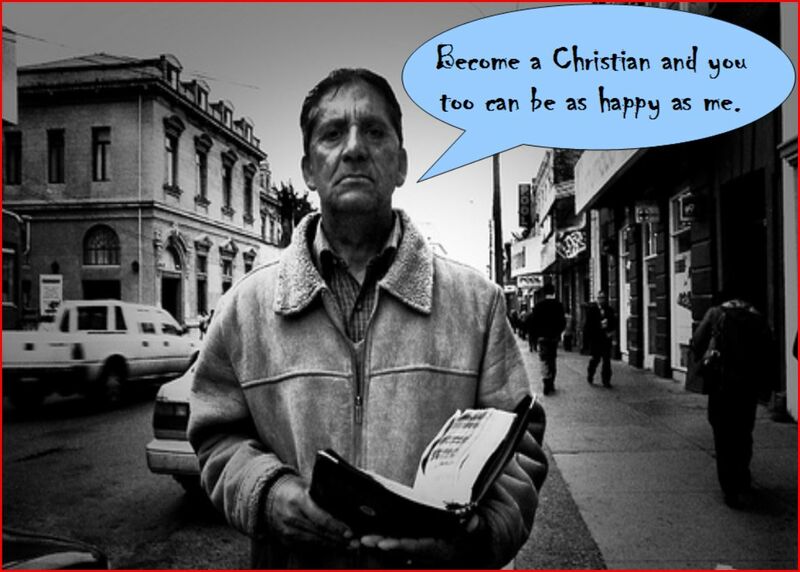 It seems to me – and I’m aware I’m resorting to personal experience here, mainly because there don’t appear to be any empirical studies of individuals pre- and post-conversion – that good people are good whichever side of the conversion experience they’re on, and hateful types are hateful whether they’re believers or not. Religion doesn’t, in spite of its claims, change people very much. At most it brings out their true natures. Much the same as alcohol, really. This entry was posted in Christianity's failure to deliver, The impossibility of faith and tagged Christ, Christian love, Christianity, Christians, church, God, Holy Spirit, Jesus by Neil. Bookmark the permalink. Hello, just a quick note on people’s pre and post conversion ‘goodness’ (for lack of a better word): there are countless examples of people who certainly have changed post conversion. I know it is but one example but a friend of mine is a convert and as a follower of Christ she got deeply involved in human rights campaigning in a way she was not previusly. There are also countless examples of people who testify of a new found faith helping them to give up drugs/crime etc. You’re right Maria, this does happen. People do change as result of religious experience or conversion, and sometimes too in the absence of religion (like when someone changes as a result of coming close to death). The fact it happens in a range of circumstances – across religions and without them – suggests it’s a human phenomenon, not a miracle from on high. I think that would be a possibility. However, there’s no link to your blog in your comment. Can you send one?